The assessment of respiratory function and metabolic state with blood gas analysis, combined with continuous monitoring from pulse oximetry and capnography is routinely performed in patients during anaesthesia, in resuscitation and in the critically ill. Blood gas analysers report a wide range of results, but the only parameters directly measured are the partial pressures of oxygen (pO2) and carbon dioxide (pCO2) and blood pH. The haemoglobin saturation (HbO2%) is calculated from the pO2 using the oxygen-dissociation curve and assumes a normal P50 and that there are no abnormal forms of haemoglobin. Some blood gas analysers incorporate a co-oximeter that directly measures the various forms of haemoglobin including oxyhaemoglobin, total haemoglobin, carboxyhaemoglobin and methaemoglobin. The actual bicarbonate, standard bicarbonate, and base excess are calculated from the pH and pCO2 using the Siggard-Anderson nomogram derived from a series of in vitro experiments relating pH, pCO2 and bicarbonate. Practical precautions: a heparinized, freshly drawn, bubblefree, arterial blood sample is required. Heparin is acidic and if too much is present, the measured pCO2 and calculated bicarbonate are spuriously reduced. Delay in measurement allows continued metabolism by the erythrocytes and reduces pH and pO2 and increases pCO2. Keeping the specimen on ice allows accurate measurement to be delayed for up to 1 hour. Air bubbles introduce error and cause a fall in pCO2 and an increase in pO2. The polarographic (Clark) oxygen electrode measures the oxygen partial pressure in a blood or gas sample. 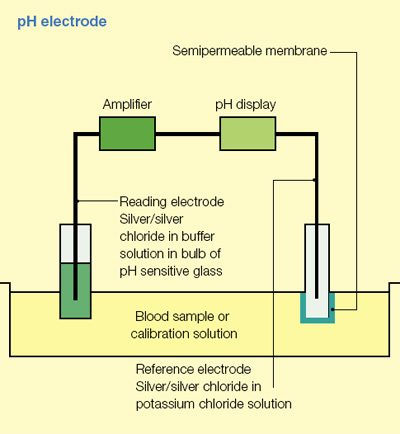 A platinum cathode and a silver/silver chloride anode are placed in a sodium chloride electrolyte solution, and a voltage of 700 mv is applied (Figure 1). The following reactions occur. At the cathode: O2 + 2H2O + 4e– = 4OH–. In the electrolyte: NaCl + OH– = NaOH + Cl–. At the anode: Ag + Cl– = AgCl + e–. Electrons are taken up at the cathode and the current generated is proportional to oxygen tension. 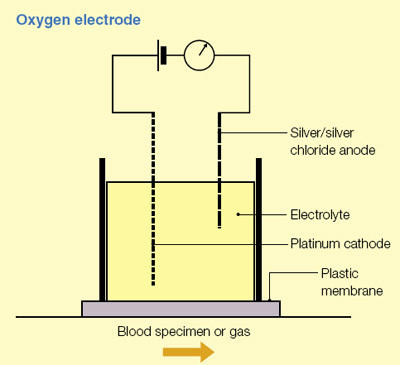 A membrane separates the electrode from blood, preventing deposition of protein but allowing the oxygen tension in the blood to equilibrate with the electrolyte solution. The electrode is kept at a constant temperature of 37°C and regular checks of the membrane are required to ensure it is not perforated or coated in proteins. Sampling two gas mixtures of known oxygen tension allows calibration. pH electrode: if a glass membrane separates two solutions of different hydrogen ion concentration a potential difference develops that is proportional to the hydrogen ion gradient between the two. A potentiometric electrode is designed to measure the potential between the sample and a buffer solution. A measuring silver/silver chloride electrode is encased in a bulb of special pH-sensitive glass and contains a buffer solution that maintains a constant pH (Figure 2). This glass electrode is placed in the blood sample and a potential difference is generated across the glass, which is proportional to the difference in hydrogen ion concentration. The potential is measured between a reference electrode (in contact with the blood via a semi-permeable membrane) and the measuring electrode. Both electrodes must be kept at 37°C, clean and calibrated with buffer solutions of known pH. The Severinghaus or carbon dioxide electrode is a modified pH electrode in contact with sodium bicarbonate solution and separated from the blood specimen by a rubber or Teflon semipermeable membrane. Carbon dioxide, but not hydrogen ions, diffuses from the blood sample across the membrane into the sodium bicarbonate solution, producing hydrogen ions and a change in pH. Hydrogen ions are produced in proportion to the pCO2 and are measured by the pH-sensitive glass electrode. As with the pH electrode, the Severinghaus electrode must be maintained at 37°C, be calibrated with gases of known pCO2 and the integrity of the membrane is essential. Because diffusion of the CO2 into the electrolyte solution is required the response time is slow at 2–3 minutes. Hypothermia, pH-stat, and alpha-stat: the solubility of all gases, including CO2 and O2, in blood increases with a fall in temperature. Thus, hypothermia causes the pO2 and pCO2 to fall and the pH to rise. As analysis of a sample taken from a hypothermic patient occurs at 37°C, the pO2 and pCO2 results are artificially high. The result can be corrected to represent the pH, pO2 and pCO2 at the patient’s temperature. In practice such correction is unnecessary. When cardiopulmonary bypass was developed it was thought that the reduction in PaCO2 during hypothermia would result in cerebral vasoconstriction. In pHstat management, CO2 was added to the oxygenator to maintain a temperature-corrected PaCO2 of 5.3 kPa and a pH of 7.4. The alternative and now standard strategy is that of alpha-stat in which a non-temperature corrected PaCO2 of 5.3 kPa and a pH of 7.4 is maintained. The true value of PaCO2 is lower than this but the associated alkalosis is thought to aid enzyme function during hypothermia. Pulse oximeters provide a safe, reliable and non-invasive method of continuous arterial oxygen saturation monitoring. They are standard monitors during anaesthesia and in the ICU.Haemoglobin saturation is measured from the absorption of light emitted from a probe placed on a digit or ear lobe. The probe contains two high intensity, monochromatic, light- emitting diodes, one emitting red light (660 nm) and the second infrared (940 nm) on one side and a photodetector on the other to measure the amount of light transmitted through the finger. The saturation of haemoglobin is calculated from the absorption at the two different wavelengths. The diodes are switched on in sequence with a pause with both diodes off. This pause allows the photocell and microprocessor to compensate for any ambient light. By analysing the pulsatile changes in light absorption, the absorption by venous blood and tissue is deducted and arterial saturation measured. The measurements are plotted against a standard calibration curve, determined by direct measurements of the arterial oxygen saturation of normal resting healthy volunteers. Limitations and errors: (see page 466) pulse oximetry is accurate above 90% oxyhaemoglobin saturation, but much less so below 70%, and inaccurate below 50%. Pulse oximeters estimate arterial haemoglobin oxygen saturation (SaO2) and not arterial oxygen tension (PaO2). Because of the shape of the oxygen-dissociation curve, large changes in PaO2 may occur at the extremes of the curve with minimal change in SaO2. They have a response time of 10–30 s, depending on the signal averaging time, circulation time and the site of the probe. Increase in the non-pulsatile component of light absorption through nail varnish or dirt increases error. Skin colour does not influence accuracy. Excess ambient light, infrared heaters and diathermy also interfere with accuracy. Hyperbilirubinaemia does not affect accuracy, nor anaemia unless the haematocrit is below 10%. Low peripheral perfusion due to low cardiac output or vasoconstriction interfere with accurate detection of arterial pulsations, as do atrial fibrillation or other arrhythmias. Carboxyhaemoglobin has a similar absorbance to oxyhaemoglobin and gives a falsely high reading for SaO2. Methaemoglobin has an absorption that is similar at 660 and 940 nm and produces a SaO2 towards 85%. The intravenous dyes methylene blue and indocyanine green also lead to falsely low values. Fetal haemoglobins do not cause error. A co-oximeter can measure carboxyhaemoglobin and methaemoglobin by analysing the absorption of at least three different wavelengths of light by blood in vitro. Capnography is a standard method of monitoring during anaesthesia and is increasingly used in the ICU. It describes the continuous measurement of expired carbon dioxide tension at the airway to allow the monitoring of the end-tidal CO2 tension. An analyser with a rapid response time is required and most devices measure CO2 tension from the absorption of infrared light, though other techniques such as mass spectrometry can be used. Sidestream sampling is most common and describes the technique of continually aspirating a sample of gas from the respiratory circuit which is then fed through the analyser. The gas is either returned to the respiratory circuit or scavenged. Sidestream capnography is favoured during anaesthesia owing to the convenience of a lightweight attachment to the airwaybut may be troublesome due to sampling line blockage by water vapour following protracted use. Mainstream sampling – the analyser head is attached directly to the airway and the gas is analysed within the respiratory circuit through a clear window or cuvette. In the ICU where inspired gases are often humidified actively, mainstream may be more reliable than sidestream capnography. Capnogram: a typical capnogram is shown in Figure 3. During inspiration the CO2 tension should be neligible unless there is rebreathing. Dead space gas is exhaled first, it contains no CO2, and is followed by alveolar gas and a rapid rise in CO2 which reaches a clear plateau in normal lungs and is termed the end-tidal CO2 tension. However, if there is significant inhomogeneity of ventilation within the lungs no clear plateau is discernible and an accurate end-tidal CO2 cannot be measured (Figure 4). This occurs in obstructive airway disease and asthma. 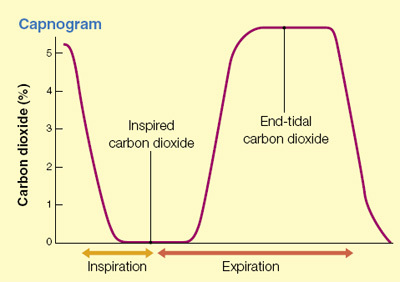 If tidal volumes are very small there is inadequate distinction between dead space and alveolar gas resulting in an indistinct expiratory plateau and the end-tidal CO2 tension is inaccurate. End-tidal CO2: in normal lungs the end-tidal CO2 tension is 0.5–0.8 kPa less than the arterial CO2 tension and is a useful non-invasive estimate of arterial CO2. The difference between nend-tidal and arterial CO2 is increased if there is mismatch of ventilation and perfusion within the lung, as occurs in lung disease. In these circumstances, the end-tidal CO2 may markedly underestimate arterial CO2 tension. A reduction in lung perfusion increases alveolar dead space and results in an end-tidal CO2 tension considerably lower than the arterial CO2 tension. 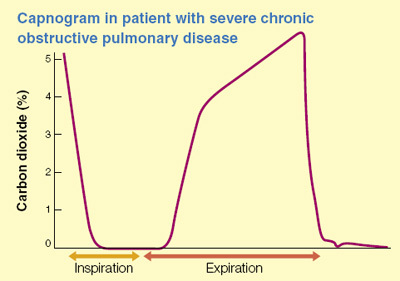 This may occur in pulmonary emboli, low cardiac output states, hypotension and following the application of high levels of positive end-expiratory pressure during mechanical ventilation. A sudden drop in end-tidal CO2 during anaesthesia may reflect a decrease in cardiac output or pulmonary embolism (e.g. thrombus, gas, fat). 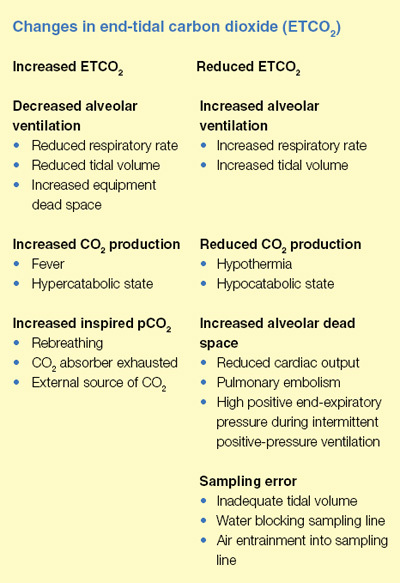 Monitoring end-tidal CO2 is useful during cardiopulmonary resuscitation for assessing adequacy. The causes of changes in end-tidal CO2 are summarized in Figure 5. Bhavani-Shankar K, Moseley H, Kumar A Y et al. Capnometry and Anaesthesia. Can J Anaesth 1992; 39: 617–32. Lindberg L G, Lennmarken C, Vegfors M. Pulse Oximetry: Clinical Implications and Recent Technical Developments. Acta Anaesthesiol Scand 1995; 39: 279–87. Severinghaus J W, Astrup P, Murray J F. Blood Gas Analysis and Critical Care Medicine. Am J Resp Crit Care Med 1998; 157: S114–22.